Serving as a launch and fundraiser event for the new ELECTRONIC SOUND + ART CHICAGO (ESAC) organization, this Saturday will be the first in a series that takes a refreshingly sincere approach within an increasingly scenester and media-driven musical landscape. 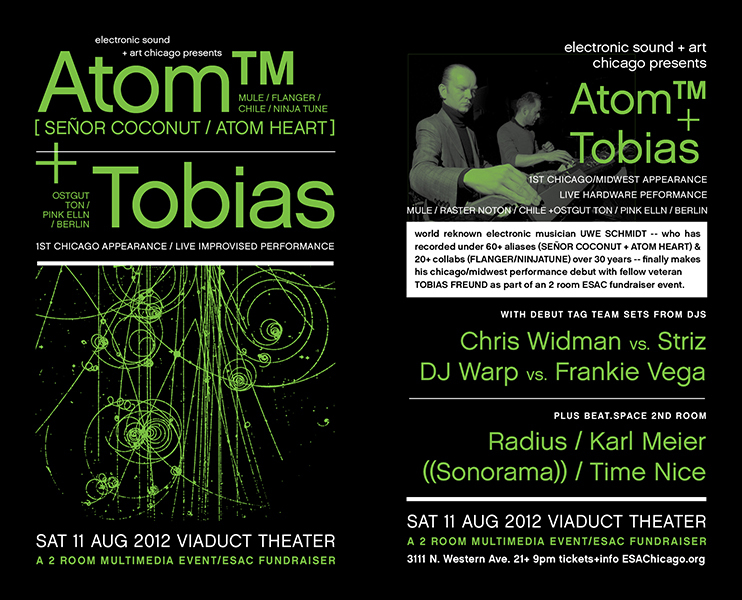 This two-room multimedia extravaganza showcasing the Chicago/Midwest debut of ATOM™(Uwe Schmidt of Señor Coconut /Atom Heart fame) & Tobias. It also features a couple surefire debut tag team spots (C.Widman vs Striz, DJ Warpvs F.Vega), as well as a second BEAT.SPACE room featuring performances culled from across Chicago’s varied electronic music community from the likes of Radius,Karl Meier, FMEL’s (((SONORAMA))), andTIME NICE (of dubscription). Presale tickets are available via Resident Advisor. The Viaduct Theater is located at 3111 N. Western. Atom™ and Tobias met around 1986, while both were still living in Frankfurt. The pre-techno scene was blossoming when they met in a studio. In 1990, Tobias was the engineer who helped mix and record Atom™’s first release ever. As a natural consequence, Tobias and Atom™ started to work together. Strangely, they collaborated not so much in a studio environment, but mostly playing improvised electronic music concerts. In 1992 they recorded one of the very first live techno recordings ever, the 12-inch “Elektroniikkaa”, which soon became an underground anthem. Their paths would separate in the ’90s – Atom™ moving to Santiago de Chile; Tobias relocating to Berlin – but would reconnect on a live stage again in 2003 at Mutek Chile. Even with a 10 year performance separation, the reactivation worked perfectly and they decided to share the stage more often. They have been playing many concerts worldwide since the successful re-launch in 2003 (Berghain, The Bunker, Labyrinth), and we are excited to have their debut Midwest appearance coincide with the ESAC launch event!